I have a bit of a issue with expensive Thai restaurants, or should I say I used to. I always thought why should I pay $30 for a Thai meal that I can get in the suburbs for $10. So even though Red Spice Road is the closest Thai restaurant to my work I had always passed on checking it out. People always had good things to say about it but I just wasn't interested. But recently we were taking some clients out for a work lunch and my colleague asked where we should go. As I am obsessed with asian food to the point of shunning almost all other cuisines I decided that seeing I wasn't paying it would be a good time to try Red Spice Road. It was a work lunch so I foolishly didn't take any photos and the food was so good I really regretted it. in particular one dish really stood out, the pork belly. 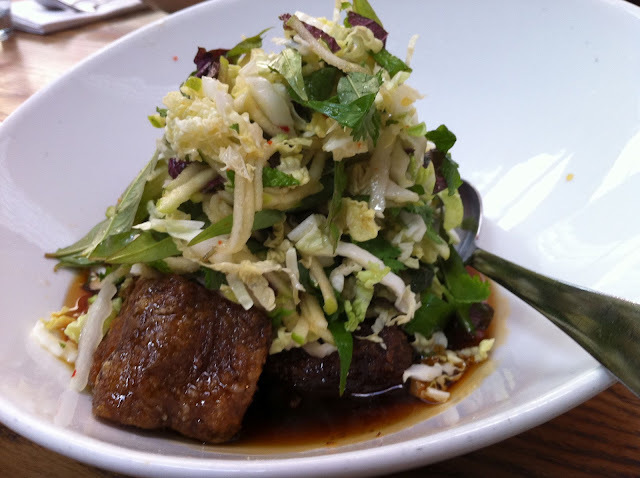 Did I mention that I love pork belly? I went home that night raving about it to Tina and was secretly trying to come up with an excuse to return so I could eat that pork belly again and this time take photos. As luck would have it a week later Charlie started day care and Tina come into the city to visit me for lunch. I seized the opportunity and suggested Red Spice Road. Of course Tina agreed. The pork belly dish is quite large and we are not huge portion eaters so I thought it would be perfect for us to share. We started with another dish that I love, miang. Red Spice Road do a couple of miangs but the best is the spanner crab. We are still pretty green when it comes to blogging and so may times we have dived right into a meal as soon as it arrives then about halfway through we look at each other and realise that we didn't take any photos. Yep, so that's what happened with the miang but I was certainly not going to make the same mistake with the pork belly. Red Spice Road is a very efficient operation and the restaurant probably seats around 100 so the meals are obviously well thought out when it comes to speed of preparation as well as deliciousness. The pork belly came out very quickly which is great when you are on a lunch break. The menu describes it as Pork Belly with Chilli Caramel, Black Vinegar, Cabbage and Mint Salad. The pork was wonderfully crispy and crunchy on the outside and then contrastingly yielding inside with juicy flesh that pulls apart easily and melts in the mouth. I am guessing that the pork is poached to get that beautiful tender fall apart texture then deep fried to crisp up the outside. 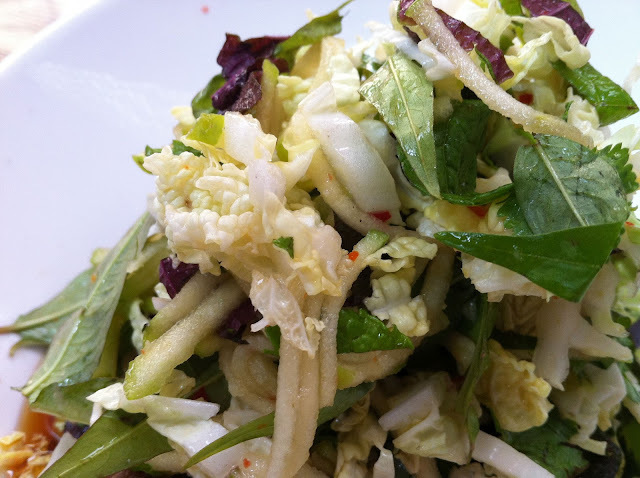 It is served topped with a lovely light chinese cabbage, shredded apple, vietnamese mint and perilla salad. All of this is wonderful but the highlight for me is once again the amazing sauce. Its another one for my "I wish I had the recipe for this sauce" list. Oh how to describe it? I don't know where to start. Its very sweet with an almost honey like consistency but at the same time beautifully balanced with a bit of sourness that you wold expect from a Thai sauce. The menu description says chilli however I didn't find it particularly spicy. So if you're like I was and have an issue with expensive asian cuisine I can understand, but trust me its worth making an exception to try this deliciously sweet succulent pork belly from Red Spice Road. At $31 for a meal that two people can share it actually isn't that expensive anyway. It takes a bit of planning and some stages need to be prepared ahead, but it's totally worth it. Hi Kek, yes I totally agree, it a pretty special dish. I've made it myself a few times although I bought the Red Spice Road cookbook. Like you say, it's a bit of preparation but the results are definitely worth it.